Revenue hungry states are pushing Congress to pass legislation to collect sales taxes on purchases made online. While brick-and-mortar store owners may believe that online ecommerce stores have an advantage because most of them do not collect sales taxes, the high cost of shipping negates that as a primary reason anyone would shop online! NOT likely to increase their sales the way they expect. People shop online for many reasons – such as huge selections and convenience – and avoiding sales tax is not likely to be highest on their list because that is offset in many cases by having to pay shipping and handling charges. Passing Internet sales tax legislation is also unlikely to increase tax revenues for a logical reason Donna Anderson pointed out in The Real Reason Congress Wants to Tax Your Online Purchases. and all of it is already being taxed one way or another! As Donna explains in that post, whether the available income is spent on product, sales tax, or all the taxes related to shipping (see her post for why shipping creates so much tax revenue) – all adding another tax burden into the equation does is to change where taxes end up – not create additional tax revenue. More taxes do not create more money out of thin air! what do we ever spend that isn’t taxed already? Her point is that when we pay more in tax we have less to spend on products and shipping and therefore tax revenue could actually go DOWN instead of up! Shipping costs usually equal or exceed sales tax so the total price is about the same. Physical businesses use local services such as police, fire, and roads that online businesses do not use. that sell the same things are not being treated the same. Governor Haslam and the businesses he hopes to help are making the assumption that by charging sales taxes online more people will buy locally. If there is any evidence at all to support that assumption I have not seen it. 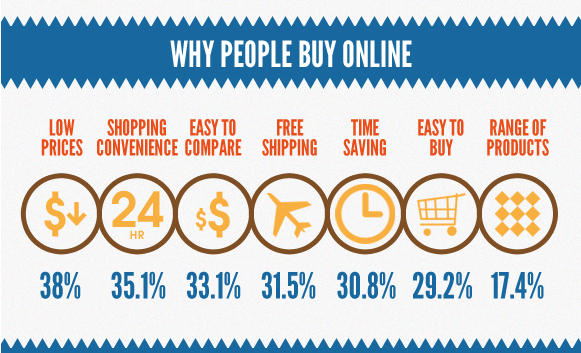 Why Do People Buy Online? I found two studies that answer this question. Neither one of them mentioned to avoid paying sales taxes – not in this research on Why People Buy Online nor in the Analysis of Online Consumer Behavior infographic. sales taxes will drive people to buy locally. Did You Know Consumers Are SUPPOSED to Be Paying Sales Taxes to States? Consumers who live in a state that collects sales tax are technically required to pay the tax to the state even when an Internet retailer doesn’t collect it. When consumers are required to pay tax directly to the state, it is referred to as “use” tax rather than sales tax. 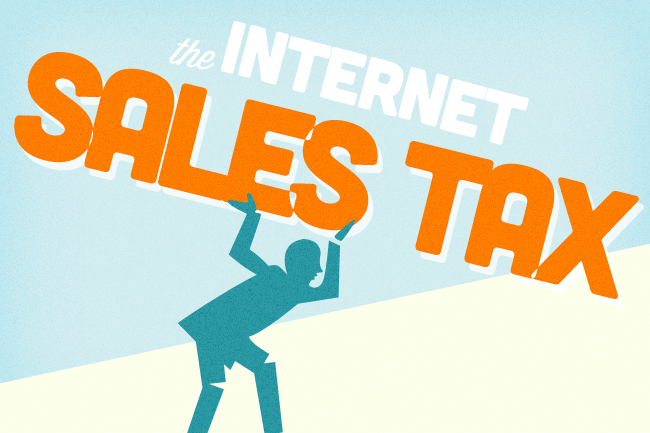 The only difference between sales and use tax is which person — the seller or the buyer — pays the state. Some states are working to educate their citizens and others have added special lines to their state income tax forms hoping to collect sales taxes voluntarily. Some states – notably Texas – do not have a state income tax so they don’t have any simple way to collect sales taxes directly from consumers. That is probably why Texas went after Amazon and Amazon started collecting sales tax from Texans July 1, 2012. While some argue that there are now solutions that ease the complexity of calculating and paying so many different percentages to so many different agencies, there are definitely additional burdens on small businesses – and what may not be a burden to a seller as large as Amazon may be too much for small businesses. Twenty-four states have worked with the Streamlined Sales Tax Governing Board in hopes that simplifying the sales tax codes would make it easier for them to be collected. It doesn’t take a rocket scientist to figure out that you do NOT want your sales to ever exceed more than $500,000 so you can avoid this requirement – which means fewer jobs created and less income taxes generated so no growth in income tax either. You can’t create prosperity by piling on tax after tax after tax. Every burden we add reduces jobs and revenue. If you had an ecommerce store with sales close to that limit what would you do? What do you think many will do? Some may choose to REDUCE SALES – and in attempting to stay under that limit they could end up earning far less – and paying far less in existing taxes. Affiliate Marketers had to deal with what they call the Sales Tax Nexus laws early on because major ecommerce stores like Amazon unceremoniously threw their affiliates out for being located in a state that passed a Nexus law – as did some merchants on major affiliate networks including Commission Junction. With clients on both sides, we are not opposed to the collection of sales tax. We are disappointed in California’s shortsighted approach to solving their budget crisis. Using small businesses engaged in the act of online advertising (aka, affiliates) as Nexus justification for non-California based, Internet retailers harms all parties involved -the internet retailers, California small businesses/affiliates, and the state government. As demonstrated in other states, many Internet retailers terminate affiliate relationships to avoid nexus. As a result, incremental sales tax is not generated since Nexus has been avoided. The impact is that the affiliate pays less in-state taxes (due to less income) and worst case, may be forced to close their doors due to the severed relationship with the Internet retailer. As a result of this bill, California will likely recognize higher unemployment – not additional funds. While there was a temporary reprieve in some states, California and Pennsylvania got tired of waiting for Congress to act and reinstated Affiliate Nexus taxes in September, 2012. Chicago-In Illinois Circuit Court, Judge Robert Lopez Cepero ruled that the Illinois Affiliate Nexus Tax law violates the Commerce Clause of the US Constitution, declaring the activity described in the statute does not establish nexus. According to the Chicago Tribune, the Illinois Affiliate Industry had approximately 9,000 companies active in the affiliate industry that generate $610 million in taxable revenue for the state. New Jersey is currently considering their options, and those in that state should read these projections of the tax revenue affects of the New Jersey Tax Nexus decision. 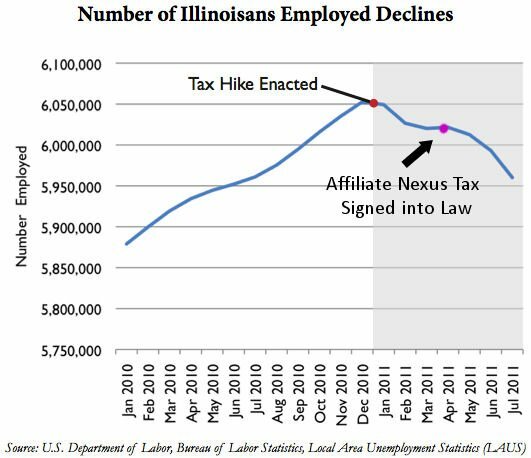 As Illinois found out the hard way, changing any tax law is going to affect other tax revenues and have unintended consequences. and get input from organizations BEFORE they pass new tax nexus laws. Love the infographic – These studies do NOT make it appear likely that sales taxes will drive people to buy locally. Brick-and-mortar businesses, especially Big Boxes like Wal-Mart, have got to realize that the Internet is here to stay and most people shop online because it’s convenient. As your graphic shows, paying sales tax isn’t even part of the equation. These Big Box monsters are wasting all this time and money trying to legislate what they think is a solution to the problem. When all they really have to do is evolve their business, right along with everyone else. I have no sympathy for Wal-Mart. I live in a very small town that lost dozens of small businesses when WM came to town. We still have no small, local business growth and the only stores that do come to town are dollar stores and fast-food restaurants. And WM isn’t the only big box that’s put small businesses in jeopardy. Unfortunately, WM has the money to spend on lobbying for this online sales tax. But like you and I both said, it’s not going to create any additional revenue – it’s just going to move it around. And in the end, it’ll be the consumer who suffers. If you live in a larger city or town you don’t realize just how much influence WM has. Makes me sick to my stomach. Thank you for taking the time to comment. I wrote this post because I agreed with your article on Examiner.com that we are barking up the wrong tree yet again. The last thing we need to be doing with the dollar sliding and the economy declining is adding more burdens on businesses. Government needs to do what people do when money is tight: stop spending. They have already pumped the well dry and the only way our economy can recover is if we support small business and remove obstacles – not add to them! I agree about Wal-Mart and other multi-national corporations. If we could get more people to stop supporting them we could change the world. I know of a small town that still thrives because Wal-Mart has not come to town – yet. Their local businesses finally woke up and are fighting the Chamber of Commerce who are trying to bring in Wal-mart AND Lowes which would put their small businesses under. So by your logic no sales tax should be collected for any purchases, online or otherwise. I think you are missing the entire purpose of sales tax and taxes in general. No, I am not saying that sales taxes or taxes in general do not have their purposes and may be necessary. I am saying that there is only so much money available to be spent so no matter where you squeeze the balloon all you are doing is moving the money from pocket A to pocket B. You can’t increase the amount available that way. As long as people focus on parts instead of the whole they will never be able to fix the problems that are destroying our economy. The government is broke – literally bankrupt – and has been for decades. Increasing taxes is only increasing the debt and it is already at a level that can never be paid off. Less government, removing fees, fines, licensing and all the other financial burdens that prevent small businesses from being successful and hiring more people is the only viable solution. If consumers continue to spend money which corporations take out of the economy money while they transfer costs of doing business onto the taxpayer economic decline and collapse are inevitable. Spend that money in small businesses and it would recirculate and improve local economies and create jobs.